No, I'm not flipping you off. 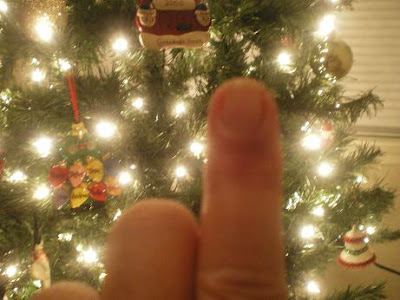 That happens to be my index finger after putting up my outdoor lights, after my finger got into it with a hammer, after putting up my tree. Then I went to Taco Bueno to get some Macho Nachos for us. But, that's not what this post is about. I was putting up my Christmas tree, and I brought out all the sentimental ornaments that I've accumulated over the years. You know the ones....the clothes pin reindeer made by a kindergartner in 1976, or the walnut skiing on popsicle sticks. Then there are the ones for your dog. The dog that went to doggie heaven in 2001 at eighteen years old. Charlie, a cockapoo.....a very macho cockapoo. This may be boring for some of you, and it will probably make some of you roll your eyes....it won't be the first time, so roll away. I'll start with this picture of Charlie and me at Petsmart in 1995, just so you have a visual of him. This is a foam handmade ornament I bought at work to support United Way in 1994.....the lollipop is nasty probably rancid. 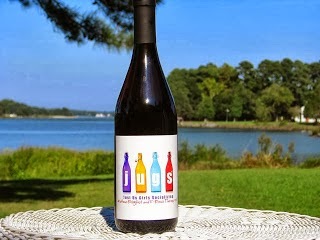 I bought everyone in the family, one of these, but I only have Charlies. I'm sure everyone else still has theirs, and puts it on their tree, right? Then we have this one from Heart Shaped Hedges husband's two cats, Bubs and Sweebs circa 1999. And another from those sweet kitties in 2000. Ok, so that's it! That wasn't too bad now was it? I still miss Charlie, and I just know he would have been best buddies with JJ......maybe! *NEW!! The 3rd in a series of my great Christmas gift ideas has been added at the bottom of the page. Check back often for more gift giving ideas. A very sweet post. I know how it is to miss a 4 legged family member. My beloved Heidi has been gone now for 4 years and I still miss her very much. 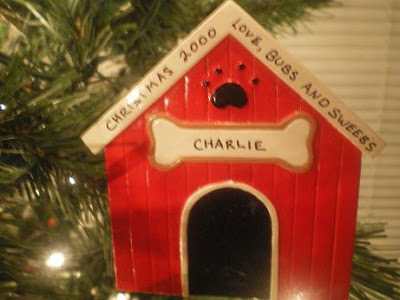 Although, I can't say that I have a collection of ornaments for my dog!!! I love it when tress are decorated with sentimental ornaments....I have friends who have trees with a theme....or only one type of ornament...B.O.R.I.N.G....I have the kids ones...falling apart or otherwise, the ones from students, ones from vacations, ones with photos and each year the memories all come back when I put them on the tree...I wouldn't have it any other way :) Enjoy the season! I love putting up the ornaments that the kids made when they were young. Nothing says Christmas like rancid lollipop. Oh, except a walnut skiin on popsicle sticks. No eye rolling here...love the ornaments. Charlie must have been a wonderful friend. I know cocoa and Ozzie would have loved him too. I love all the home made old ornaments too. I put up our "regular" tree w/ the nice ornaments and then we have a smaller one in the family room w/ all the kids school made/picture ornaments. Be careful on the deocrating...it is dangerous. 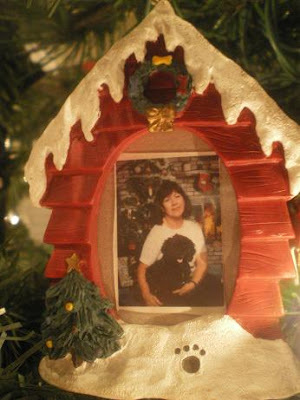 We'll be putting up the Christmas tree this weekend and there will be sentimental ornaments that make me cry as we do. My very first cat I ever had lived to be 17 years old. And I've had a couple of dogs live 10+ years. Not to mention all the kids' homemade ornaments. Chuck!!! Our black brother. Isn't there a reindeer made out of clothes pins I made you? BTW, I just signed up a new Chocolatier in Cedar Park, TX...maybe you can have a Dove Chocolate Tasting party for your friends at the compound. Actually, I am doing a party tonight in Laguna Woods (formerly known as Leisure World)....Good times! We have ornaments AND stockings for every animal we have ever owned....that's six to-date!!! 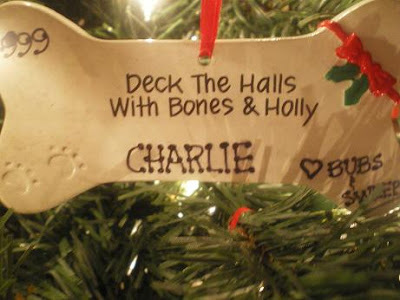 Can't imagine NOT including them in the celebration:) The memories of our pets are just as important to us as the memories of our daughter making those little ornaments out of construction paper and glitter!!! I can't wait to pull out the Christmas boxes!!!! HSH is right, no photo with all of us. Maybe you can take one with the R Family and photoshop the rest of us in. Oh geesh! After all these years, my kids are still jealous of the damn dog! What's up with that? That photo was the only time I got Charlies picture taken...and no one was in the store but us, and that wasn't even the reason we were there! I will do a post with the group picture from Christmas 2000, the last time all four were together for the Holidays. 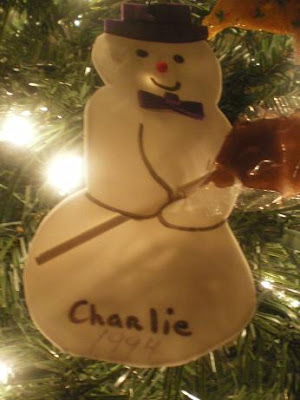 This particular post was about Charlie....but believe, me, I can't wait to post the pictures from Christmas Eve 2000. FYI, Kelly, you had just driven in from Denver to CA, remember? And even though your black brother Chuck was still "with us", he didn't get to go to LegoLand on the train with the rest of us. I not anymore jealous of the dog than I am of that foriegn exchange student from Japan. Remember? You used to throw fabulous parties for him and his Japanese friends...remember? HSH - For what it's worth, my mother spends 99.9% of her time with animals and that last tenth of a percent with humans, which includes 2 grandchildren who live right next door. Although she never had an exchange student, she always said she wanted to adopt a Korean boy.